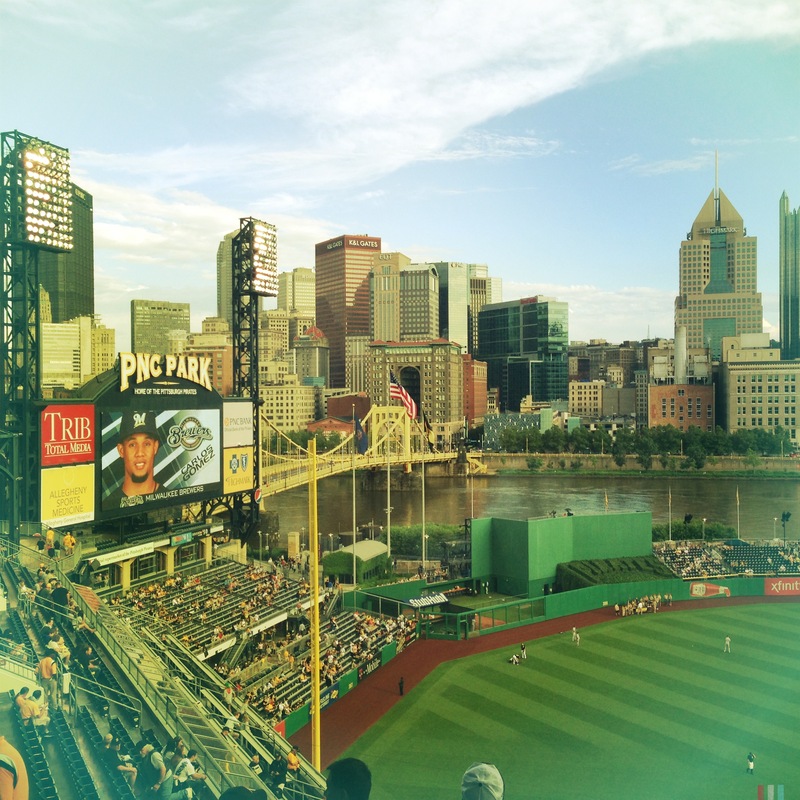 PNC Park, Pirates v Brewers, June 2013. Favorite park so far. And yes, the Brewers lost. I grew up with the sounds of baseball flowing over radio waves. Living in Chetek, Wisconsin, my Grandpa felt closer to his beloved Minnesota Twins, aka his Twinkies, than the Milwaukee Brewers, and the only thing I ever remember seeing on TV at their farm was Twins baseball (and the Macy’s Thanksgiving parade, but that was a special occasion). He was the kind of man to mute every commercial, but for Twins games, he permanently muted the TV and cranked the radio. Sometimes, after coming in from chores on the farm, he would just go to his room, turn out the lights, and lay there and listen to the sounds of his baseball team on the AM radio. That was his Me time. In the 90s, I became obsessed with the Atlanta Braves. I find this acceptable since they were at one time the Milwaukee Braves. I had newspaper cutouts of Glavine, Smoltz, Maddux, Avery, Chipper Jones (those socks! ), and David Justice taped to my walls. I could name every player and their position, and I taught myself how to read baseball stats. That was when I first experienced the kind of disappointment that only a dedicated fan can experience. I mean, they advanced to the World Series five times in the 90s, only winning it once!? Then I became a Milwaukee Brewers fan and learned what true disappointment was. But that’s okay. I actually don’t mind cheering for a team who doesn’t win all of the time, and isn’t really expected to. It makes it that much better when they do. 2011 was the most stressful year in my baseball watching career; I spent a lot of time on the toilet, and a lot of time drunk, as both seemed to calm me down. I lost my voice watching the Brewers come back against the Minnesota Twins at Target Field, scoring four runs in the 9th inning to win 8-7, and I will never forget my first NLCS game against the Cardinals that year, both games reminding me why I love baseball and hate the Cardinals. Hate is a strong word. Out of all baseball teams in the NL, they are my least favorite. In 2010 I decided to follow every 12-year-old boy’s dream of completing a ballpark tour. I travel to Brewers and Twins away games, because everyone knows you can have two favorite baseball teams if they are in different leagues. I’m about to attend my 13th ballpark, Turner Field, where I will witness the Brewers take on the Atlanta Braves, and let me tell you, being a Brewers/Twins traveling fan isn’t easy. Some fans are rude, some fans point and laugh, some are sympathetic, and others are friendly, especially after we lose, but it’s all worth it. The sounds and smells of the baseball game send me to my happy place, and I buy the rude fans a beer, make friends with the local fans around me by poking fun at Ryan Braun, a surefire way to worm my way into their hearts, sit back in my seat and just take it all in. Has this year been rough? Yes. But hey, at least I’m not a Yankees fan.